As race day neared, I started displaying typical “runner behaviour” and thinking of excuses as to why I wasn’t going to smash all imaginable race records. My first, long-standing, excuse was an injured IT band, but that fixed itself a few weeks earlier. My second excuse was a dicky groin but that, thanks to an unnecessary 20km walk the day before the run, somehow also fixed itself. My third excuse was that it was already almost 30 degrees in late March in Madrid but a cold front had since come in and temperatures had dropped. Sadly, I had no excuses left other than “I’ve not trained enough” and “this course is pretty hilly” so I would just have to get on with it and stop being a pre-race-apologist. Although my final thoughts were that this was a well-organised race, we started off thinking it was average, to say the least. On the Saturday, we had to queue over an hour to pick up the starting pack at the expo (the photo only shows about one tenth of the length of the queue!) and, on the Sunday, the bag drop off area was over a kilometre away from the starting line which meant Pippa (who was running in the 10km race half an hour before me) and I had a little less time than planned to warm up to make sure she made the start line! The pre-race toilets were also lacking both in quantity and, erm, ‘quality’, although Pippa did manage to make a whole row of queuing men laugh when she burst out of the portaloo gasping for air and almost retching. 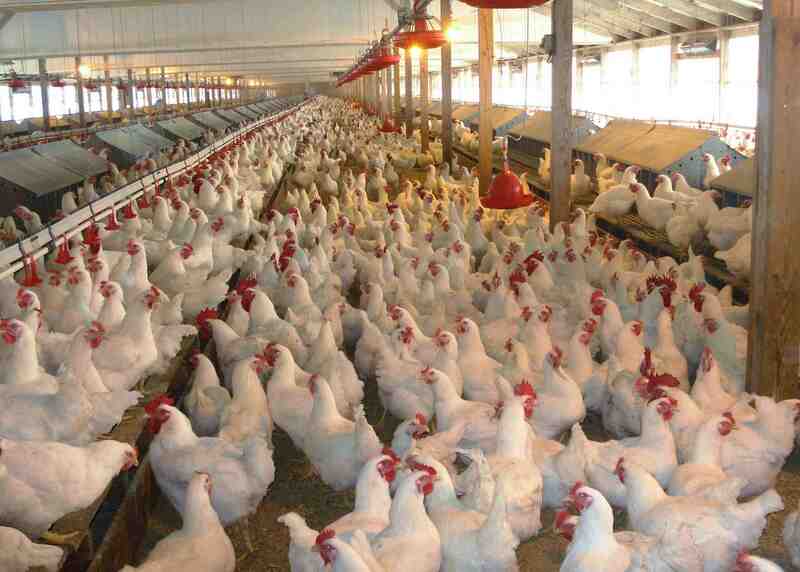 The final “could do better” thing was that no-one was guarding the starting pens so far too many late runners were jumping over and under the barriers into the fastest pen which meant I felt more like a chicken in a poultry farm than a pseudo-athlete in a marathon. It was actually verging on being dangerously tight but, soon enough, we were thankfully off! 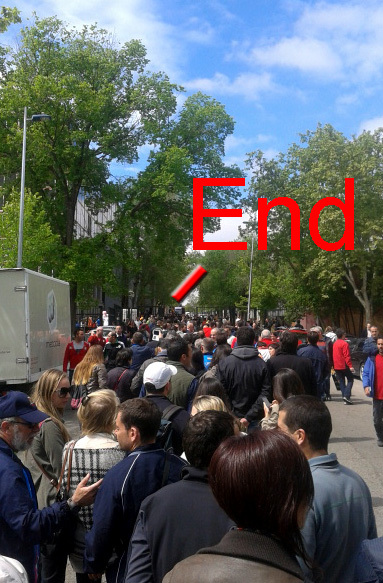 The race kicked off outside the Del Prado museum and headed uphill towards the Bernabeu stadium. Because so many slow runners had jumped into the first start pen, the pace was pretty damn frustratingly slow (and, as I had no excuses not to do well, I didn’t want to lose time right at the start!) 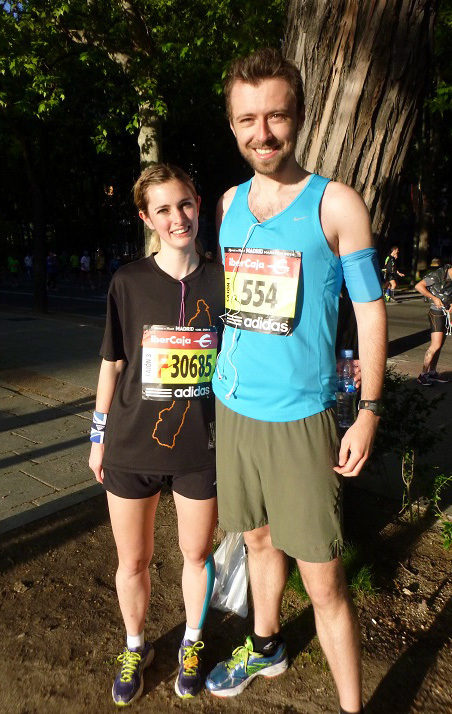 so, after about 200m, I pushed my way through the crowd and ran the first kilometre up a parallel side-road! You’re probably not meant to do that but, then again, you’re probably not meant to strangle other runners too so this was the best of two evils! Shortly after that, I crossed paths with Pippa who was just finishing off her 10km in a 55minute personal best. The first 6 kilometres were tough as it was non-stop hills until you reached the financial district, after which it was a mixture of flat, downhill and a few hills. It was a little like running in Edinburgh, apart from the sun, warmth, and people not wearing 6 layers of clothing in Spring. There were even a few spectators playing the bagpipes (or a very similar high-pitched Spanish version of them)! 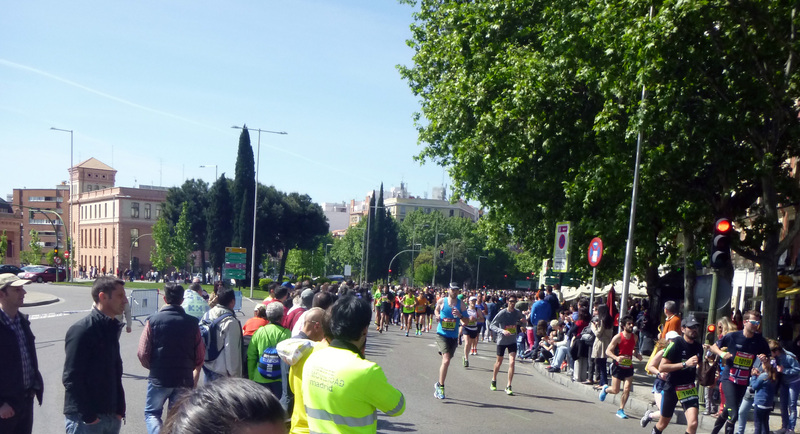 The organisers seemed to have done their best to make this race go past all the famous sites, which was great for sight-seeing: Museum del Prado, Plaza Mayor, Royal Palace (although I didn’t actually realise I had run past it until we went there the next day. 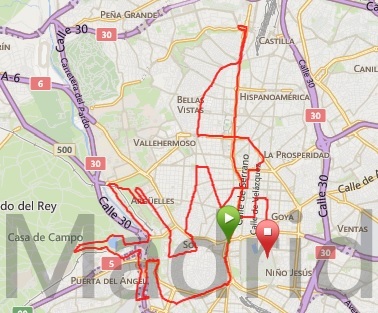 I must have been so focussed… ha), the La Almudena Cathedral, the Case de Campo park and the El Retiro park, amongst many others. The glorious sunshine helped enjoyed Madrid too which, overall, was much nicer than we had expected. Back to the race. Going mostly downhill from kilometre 8 to 30 was a blessing and it certainly helped everyone catch up on the time they lost at the start. However, every time you went down a hill, you felt a mixture of joy (“it’s easy!”) and utter despair as every metre we descended equated to another metre to climb at the end (“killllll meeee”). One funny novelty in this race was the high number of ‘helpers’ on rollerblades spraying whichever muscle you pointed to with some sort of pain-numbing spray. I have to admit it didn’t make a blind bit of difference when I asked them for a psshhtt but, well, it looked like a cool idea! It was around the start of the final 7km climb (from km33 to km 40…thanks organisers!) that I got overtaken by Zorro and a hoard of runners with huge thighs and ‘Trail Running Finland’, ‘Trail Running Spain’, ‘Trail Running Italy’, ‘Trail Running EveryBloodyWhere’ on their backs. Hills are most certainly not my strong point, in particular not a 6.66km non-stop hill from hell at the end of marathon! The advantage of running on the side of a road is that you always get a few photos taken of you by the official photographers – in this instance, I had almost 40! Most were crap, some were very crap but almost all showed a slightly perturbing “running style” which seemed to suggest I land on approximately 2cm2 on the outside of my foot all the time rather than, say, the flat of my foot. Let’s see how long it takes for my shins to splinter…! After one final sprint (at under 3min/km!) 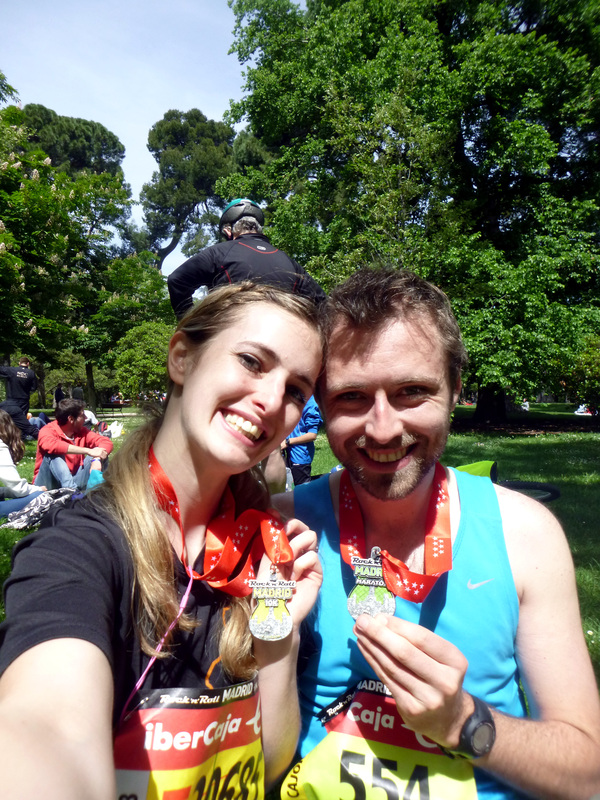 through the El Retiro park, I crossed the line in 3h14.37 which, considering the course profile, was pretty decent. I did the first half in 1h29 which was a minute ahead of target so, although I thought post-race that I could have gone faster (I think everyone thinks that after a marathon because they get skewed by the false impression that they were slow throughout as the last thing they can remember is struggling at the end), I was satisfied and it was a good practice run ahead of Berlin in September. The finish area was good too: lots of free food/drink, a cool medal and, best of all, a park and magnificent sunshine to rest in. All in all, good job by the organisers! Overall, I was the 14th fastest Brit, 13th fastest British male, 10th fastest British male in my category and fastest British male in my category with dodgy facial hair, wearing a blue vest, measuring around 6ft5 and born in 1986. Go me. I was initially one place lower (and 40 places lower in the overall rankings) but they seem to have disqualified a few cheats/exceptional runners who had posted “suspicious” second half timings. One, in particular, a British guy called Ali ran the first 10km in 1h17 but the last 32km in 1h30 (faster than Mo! ), thereby going from 10,000th to 237th! I was glad to see, a couple of weeks after the race, that he’d been disqualified, in particular considering his bastardly smug look in his finisher’s photo! The winner finished in 2h09 which, at that pace, means he’d have covered just over 60km in the time it took me to finish. Ugh. Even Ali couldn’t do that!